2206, 2208, 2210 E Douglas Ave. 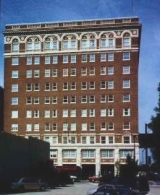 The Lahn Building was built in 1922 east of downtown on East Douglas Avenue and illustrates the commercial development that occurred throughout the Wichita following the expansion of the city limits in 1919. Development along this section of Douglas, then the city's main east/west thoroughfare, followed the establishment of Wichita's "Auto-Row" on Douglas immediately east of downtown and coincided with the selection of the site across the street from the Lahn Building as home to Wichita East High School. This modest commercial building interprets the story of resourceful Latvian Jewish immigrants who came to Wichita in 1905 to escape Russian persecution and to pursue the American dream. Eli Lahn, in partnership with his son-in-law David Krashin, erected the building as an investment, a venture that would help support the Lahn family for 77 years. The two-story building was designed to maximize income-producing potential, with three retail spaces on the ground floor and six apartments on the upper floor. The building has housed numerous small commercial businesses during its more than ninety-year history. It was nominated for its local significance in the area of commerce. The Lassen Hotel, originally constructed in 1918 with an addition in 1922, is an eleven-story, red brick and terra cotta building. Named for Henry Lassen, a Wichita flour miller and an investor in the hotel, it is a combination of Commercial and Second Renaissance Revival styles. At the time of its construction, the hotel was the first high-rise in Wichita as well as the tallest building. Many notable people were guests of the hotel including William Jennings Bryan, Vice President Charles Curtis, John Phillips Sousa, Sergei Rachmaninoff, Knute Rockne, Jack Dempsey, Will Rogers, Rudolf Valentino, Charles Lindbergh, and Amelia Earhart. In 1930, the hotel owned and operated Wichita's oldest radio station, KFH that stood for the "Kansas Finest Hotel". The Lassen Hotel was nominated for its contribution to the development of commerce and for its architecture. 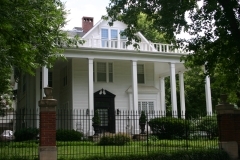 Lorenzo D. Lewelling and his family lived in this Wichita house during his brief tenure as the Governor of Kansas. He was nominated by the Populist party of Kansas to run for governor in 1892. He was elected in November and inaugurated as governor in January 1893 at the beginning of a turbulent legislative session known as the "legislative war of 1893." Disputes between the Republicans and Populists about leadership in the House went all the way to the Kansas Supreme Court. Although eventually resolved in favor of the Republicans, the dispute marred Lewelling's tenure as governor, and he was not reelected in 1894. He served in the State Senate in 1896 and was later appointed to the Board of Railroad Commissioners in 1897. This two-and-a-half-story, wood-frame house features a foursquare form with a mix of Colonial Revival, Queen Anne, and Shingle styles. It was nominated to the National Register for its association with Lewelling and its late nineteenth-century architecture. 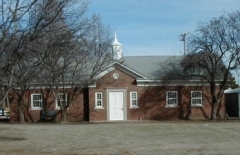 Located in the northwest corner of Linwood Park, the Linwood Park Greenhouse and Maintenance Building were constructed in 1935 as part of the New Deal-era Works Progress Administration (WPA). These are the only extant New Deal buildings in the park. Architects Lord and Burnham of Irvington, New York, designed the greenhouse, but it is not known who designed the maintenance building. Both buildings are brick and feature Colonial Revival architecture. 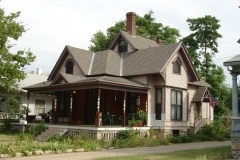 They were nominated to the National Register as part of the "New Deal-Era Resources of Kansas" multiple property listing. 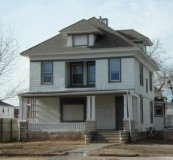 2002-2156 S Hydraulic Ave; 2001-2157 S Kansas Ave; 2021-2187 S Minneapolis Ave; 2101-2282 S Minnesota Ave; 1902-1964 E Stafford Ct; 1902-1908 E Hodson St. The Linwood Place Historic District is a 40-acre residential neighborhood on Wichita's south side near the city's aircraft-related industrial area, and it includes 90 fourplex buildings, a maintenance shop, and four unrelated and non-contributing buildings. The complex was developed by Ray Garvey and his son Willard of Builders, Incorporated. 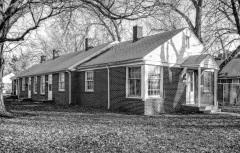 The firm specialized in constructing affordable housing in Wichita during the booming post-World War II years. They closely followed the requirements mandated by the Federal Housing Administration that involved appropriate location, access to commercial services, access to bus and automobile routes, local zoning and siting requirements, and street design. The district was nominated as part of the Residential Resource of Wichita, 1870-1957 and Historic Residential Suburbs in the United States, 1830-1960 multiple property nominations for its local significance in the areas of community planning and architecture. Likely enticed by his older brother and Wichita pioneer businessman Charles Luling, a young Julius Luling arrived in Wichita during the height of the 1880s real estate boom. Julius began his laundry business career at the Wichita Steam Laundry, the city’s first professional laundry operation. He remained there until 1910 when he began operating his own laundries. 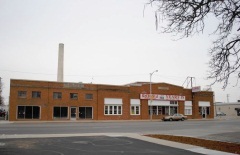 In 1924, Julius followed the lead of many other prominent businessmen and industrialists and hired well-known Wichita contractor George Siedhoff to construct a new laundry building. When it opened, the Luling Laundry employed 60 people, most of them women. The arduous laundry process consumed 50,000 gallons of near-boiling water each day, and began with a rinse, then an hour-long wash, and then dried with "centrifugal water extractors" whirling at "a rate of a thousand revolutions a minute." Starched clothes were hung and passed through a steam chamber. Although Julius died unexpectedly in 1929, his laundry business thrived and expanded in the 1930s. 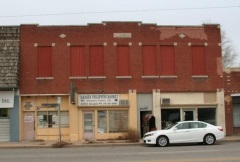 The building is nominated for its association with the steam laundry industry in Wichita and for its Commercial-style architecture. Spanning the Big Arkansas River along South Broadway in Wichita, the John Mack Bridge is the largest Marsh Arch Bridge in Kansas. 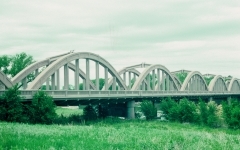 The Marsh Engineering Company of Des Moines, Iowa designed the eight span bridge in 1929. Work on the bridge began on January 30, 1930. On July 22, 1931, the bridge was dedicated in the name of John C. Mack, a newspaper publisher, senator, and member of the Kansas State Highway Commission. The dedication ceremony was attended by thousands of people who danced to the music of the Bob & Laura Collins Orchestra on the brand new bridge. It was nominated for its association with the growth of Wichita and for its engineering. Constructed in 1888, the Market Street Cottage is a one-and-a-half story, irregular-plan, wood-frame, Queen Anne style residence. The house features a gable-on-hip roof with projecting gables, two corbelled brick chimneys and a pedimented porch with a denticulated cornice supported by turned posts and a jig-sawn balustrade. It is nominated for its representation of the typical 19th century housing pattern book and how it was applied to middle/working class homes of the era. 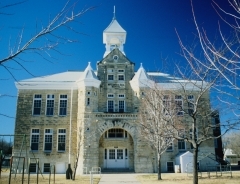 Built in 1890, McCormick School is the oldest extant public school in Wichita, and the last remaining public school designed by the prominent Wichita architectural firm of Proudfoot and Bird. The Richardsonian Romanesque two-and-one-half story building features a truncated hip roof and is constructed of brick with a limestone veneer. The front entrance is notable for its twin two-story polygonal towers linked by an archway. It was nominated for its architecture and its association with local educational history.